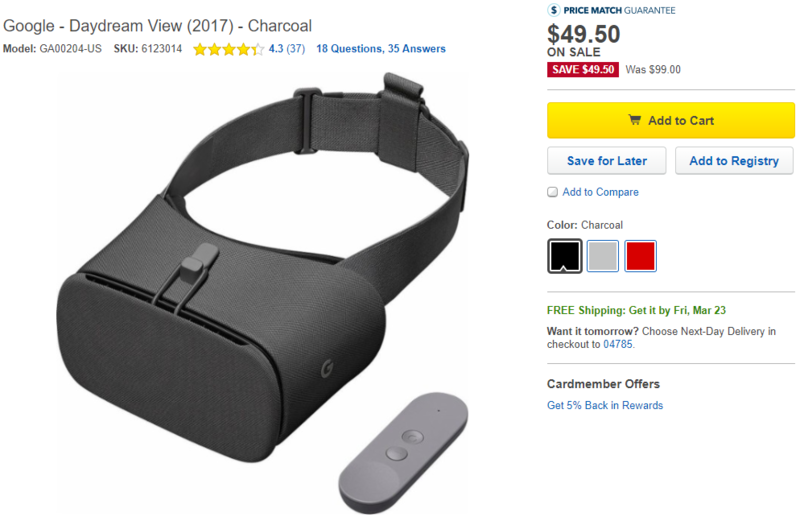 Augmented Reality and ARCore are the hottest games in town nowadays, but if you're still grappling with the idea of Virtual Reality to begin with or if you prefer to immerse yourself completely instead of superimposing something on top of your existing world, then there's a nice deal for you at Best Buy. The retailer is offering the 2017 edition of the Daydream View headset for 50% off. This is the one that has the better materials, better lenses, and the matching colored controller. The discount brings the price down from $99 to a more palatable $49.95. All three colors are available - charcoal, fog, and coral - and shipping is free. So if you have a compatible phone, like the Google Pixel or Pixel 2, Samsung Galaxy S8/S8+/Note 8, Moto Z, Moto Z2, and you want to dip your toes in the VR world, this doesn't seem like a bad investment of your money.